Marble / Limestone is a very dense, hard stone with a wide range of colors and vein patterns. The "honed" finish is a matte look and soft feel. It reflects light, but the reflection tends toward the "soft and fuzzy", not mirror like. It is low in absorption and is susceptible to acidic liquid damage. Therefore, it does need protection with a sealer. (See other page for the polished finish). Some "honed" stones are actually polished so finely that they approach or are in the "polished" category. See the page on polished marble for more information on the highly polished stones. Used extensively in high end applications, but can create dissatisfaction due to entirely preventable traffic wear, etching, and stains over time. See below for protection and care. When you look at the pictures above, you see part of the confusion about these materials. You cannot tell by look or feel which is limestone and which is marble. Actually, they are the same stone called by different names by the sellers. The cleaning and sealing characteristics are the same under either name. Three concerns: 1. Stop etching by acidic liquids. 2. Stop dulling traffic wear. 3. Retain the soft, honed appearance and feel. All are accomplished by the correct sealer choice. See below. When you compare honed marble and limestone to honed granite, it is often difficult to tell which is which. You cannot tell by look or feel. But, granite does not react with acidic liquids. Here is how you can do an acid test to confirm which you have. Be sure to test on the underside as acid will etch marble and limestone faces. * Should not be needed after using Grout Easy. Grout Residue Remover is an acid based product, so dilute way down and use with caution on cement smears. ** If the stone has scratches to be removed before sealing. This process will dull a polished finish in rubbing out a scratch. So test the process described carefully including the SBS Sealer aerosol to restore the high gloss finish. #2. If the Honed Marble or Limestone is grouted, but never sealed. * Grout Residue Remover is an acid based product, so dilute way down and use with caution on cement smears. #3. If the Honed Marble and Limestone has had a sealer applied in the past. * If the stone has scratches to be removed before sealing. This process will dull a polished finish in rubbing out a scratch. So test the process described carefully including the SBS Sealer aerosol to restore a high gloss finish. 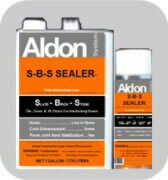 S-B-S Sealer on a honed limestone. Creates a matte finish unless applied heavier to create a close to polished finish. The stone now has a barrier to acidic liquid etching. Acid Protection: This picture shows a liquid line of full strength muriatic (pool) acid. The arrow points to the left half protected with SBS Sealer. There is no fizzing on the sealed half because the acid cannot contact the stone through the sealer. A honed limestone/marble stone finish has unique criteria that limits choices in sealing. It is usually desirable to have very little if any change to the factory finish. "Fine Stone Sealer" . This sealer is | Water Base | Coating Type. Provides: no color enhancement | no gloss. Coverage guidelines (depending on absorption) 150 to 500 sq.ft./gal. Red arrow shows water drop spreading on unsealed left half. 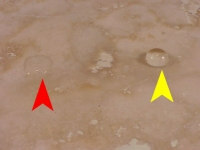 Yellow arrow shows water drop maintaining a high bead on the sealed side. A honed stone finish has unique criteria that limits choices in sealing. It is usually desirable to not have an observable change to the factory finish. "Fine Stone Sealer" will meet that criteria. 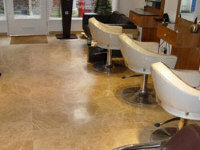 Easy Care Products: for a Marble and Limestone floor. "Maintain" - for no streak wet mopping of Marble and Limestone and all other types of flooring. You may have heard of concerns about Marble and Limestones. All of them would be prevented with the information we provide here. Therefore, you can have the floor you want! There is no need for confusion or problems brought about by misidentification of a surface type, yet it happens all too often. Sellers use fancy marketing names that can be misleading about the true nature of a surfacing. For instance, a customer was told they bought "Petite Marble and Limestone" for a bar surface. But, unlike granite it was etching circles from wine drips. After simple testing, it proved to be a limestone which is treated very differently than granite. It was easily restored and protected after a 60 second test. Please review our "Surface Types" page to compare pictures, descriptions, and testing if needed, to confirm you have what you were told.